Tennessee Governor Bill Haslam has appointed Patricia Head Moskal of Nashville as Chancellor of the Chancery Court for the 20th Judicial District, which serves Davidson County. Moskal replaces Chancellor Claudia Bonnyman, who retired earlier this month. Moskal, 64, has practiced law in Davidson County for more than 30 years. Her vast legal experience includes representing clients in complex business and commercial disputes and appellate litigation. 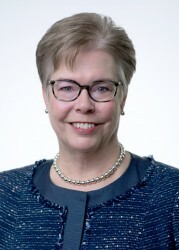 She has practiced with the law firm of Bradley Arant Boult Cummings since 1985 and has been a partner since 1992. While at Bradley, she has served on the firm’s diversity, recruiting and pro bono committees and has provided regular pro bono service throughout the Middle Tennessee community. Moskal has been awarded numerous professional honors and distinctions. She is very active in the legal profession and currently is chair of the Business Court Docket Advisory Committee and serves on the Nashville Bar Foundation’s Board of Trustees. She is a Past President of the Lawyers’ Association for Women. Moskal obtained a bachelor’s degree from Indiana University and earned a law degree from the University of Tennessee College of Law. Before law school, she taught special needs children for six years. Moskal is married and has two sons.